In the last lesson we learned how we can use a seismogram to determine the distance to the epicenter. Aside from knowing the distance we may want to also know where in the world the earthquake occurred. The first thing we need to do is figure out the distance from each seismogram to the epicenter, using the same method we learned in the last lesson. Now that we know the distance from each location to the epicenter, we need to mark those distances on a map. 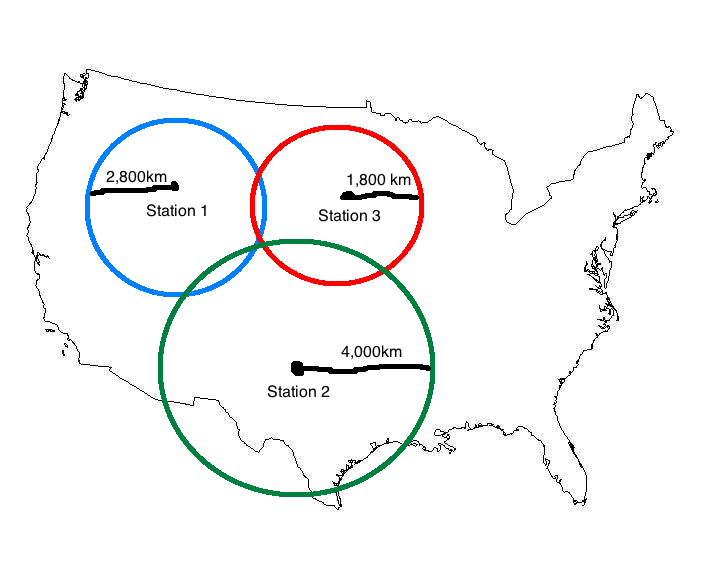 However, since we don't know the direction to the epicenter, we need to DRAW CIRCLES AROUND EACH STATION WITH A RADIUS EQUAL TO THE DISTANCE WE JUST FOUND. The three circles that we drew should intersect, or nearly intersect, at one point. That point is the epicenter of the earthquake. Mark the epicenter with a big X.